Located in a quiet cove in West Alton, the cottage has two bedrooms (one double bed in each bedroom), Bath with shower, Galley style kitchen, cable T.V., DVD player, gas grille, and a large deck overlooking the lake. Dock availability, pending size of boat. $1,000.00 per week plus a $250.00 security deposit. 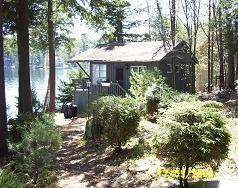 The security deposit is refundable if upon departure, the cottage is cleaned and left damage free. Some nightly rentals are available at $175.00 per night with a 3 night minimum stay.